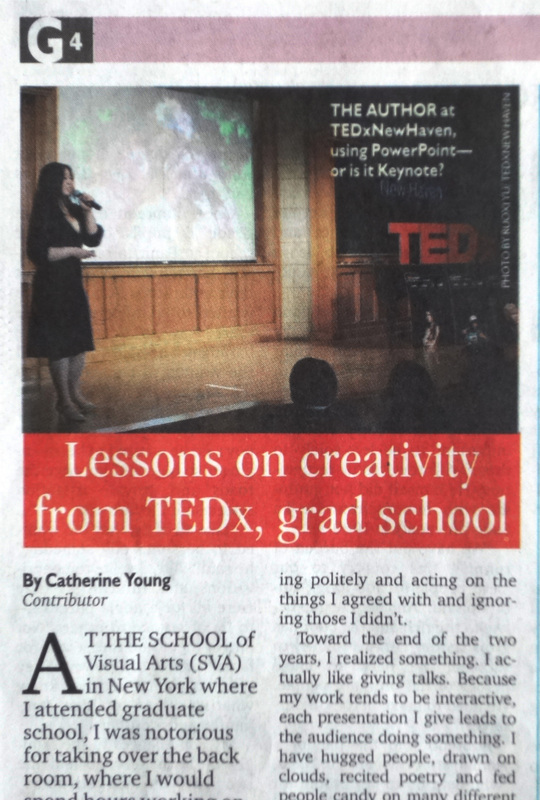 Lessons on Creativity from TEDx and Grad School, page G4, Learning section, Philippine Daily Inquirer. There are many types of makers, but alas, I am a reclusive one. My dream house will likely resemble the Bat Cave, with wifi and a martial arts room. I can work in yoga or taekwondo pants the whole week. I have gone for days without speaking to a soul. In the School of Visual Arts, where I attended graduate school, I was notorious for taking over the back room, where I would spend hours working on projects. Occasionally, I would come out, corner one of my colleagues, and squeal, “Guess what I made?” One of them said I was like a crazy scientist. I grew up loathing Powerpoint presentations. And so it wasn’t without biblical agony that we had to keep giving them in all my classes at SVA. In the beginning, my slides were admittedly very simple. Coming from a very scientific upbringing, I grew up thinking that presentation was secondary. But like it or not, slides and videos are the currency of today’s digital world. It is, according to a friend of mine, a way to figure out what is going through my head, so that one does not exist in a vacuum. Graduate school is an exercise in, among other things, humility. And so I sucked it up and improved myself, one Powerpoint presentation at a time. I concentrated on making my images pretty and my fonts well thought out. One time, my classmate Benjamin sat me down and made me redo all my slides for a final project in class. It was late in the evening, but I gritted my teeth, silently wished him evil thoughts, and worked on the feedback that he gave. Speaking in public was also an ordeal I learned to get over. Graduate school critiques tend to be overly, well, critical and skeptical, as they are supposed to. It’s easy to be wounded by comments from your professors and classmates who just want your projects to reach their full potential. I learned to take feedback with a grain of salt, listening politely and acting on the things I agreed with and ignoring those I didn’t. Towards the end of the two years, I realized something. I actually like giving talks. Because my work tends to be interactive, each presentation I give leads to the audience doing something. I have hugged people, drawn on clouds, recited poetry, and fed people candy on many different occasions. It’s quite fun. I also learned to be able to do these talks under extreme stress. Right after my thesis defense, I had to hop on a train to Connecticut to speak at TEDxNewHaven the very next day. It was a test of not passing out and still looking alive and peppy, since I had four talks to give throughout the day. One of my fellow speakers told me that she thought I was very brave, “having four interactive talks while I have one memorized talk.” “Oh sweetie, if you only knew I was dying inside,” I said silently through my frozen smile. A slide presentation is just like theater. The audience matters just as much as your talk. The times when I felt most alive while clicking through a Powerpoint were when the audience was warm and receptive. I would feel joyous when I saw that my work, which I did primarily out of curiosity, actually touched another human being. I learned that I didn’t have to talk as though I were on a home TV shopping channel, and that I can engage the audience in an actual meaningful conversation. Slowly, I finally got out of my hermetic shell. Finally, it is important to involve your friends. I think that 80% of the work should be done before you even go onstage, and my friends have always been silently in the background. Thankfully, I have friends who know more about styling one’s hair and clothes than I do, and this will likely be something I will always entrust to them. But I still hate using flashy animations. For everyone who has helped, listened, and critiqued. An edited version of this essay appeared as “Lessons in Creativity from TEDx, grad school,” on page G4 of the Learning section of the Philippine Daily Inquirer on 3 September 2012. It also appears in its online edition on 2 September 2012 here. Make sure to practice early and often. Practicing at home in front of a mirror can help you with your body language. Do whatever it takes to become comfortable with what you have to say. Being familiar with your speech is a necessity, but memorizing or reading from written material is not. Instead of reading your whole speech when you are at the podium, make a list of points that will remind you of each subject that you plan to cover. It is always a good idea to personalize your speech, and discuss personal stories that will hold the attention of the audience. Also remember to pace yourself, and speak slowly and steadily so that you are understood by everyone in the room.